What is Google’s Local 3-Pack. Formerly called Google’s Local 7-Pack, Google’s Local 3-Pack is the list of three organic business listings showing right under the Google map, on the first page of search results for a specific query. It is displayed accordingly to the searcher’s location. So if the searcher is located in Stamford CT, the 3-Pack listings shown will be nearby. If you are a local business, working on making it in the Local 3-Pack should be your top priority. This would greatly improve your local business online visibility and success. How to rank in Google’s Local 3-Pack? Ranking in Google’s 3-pack can be a life changer for any local business. It will definitely bring more traffic to any website lucky enough to make it in Google’s 3-pack. Start by signing up for Google My Business. It’s free! Never add unnecessary information to your name (e.g., “Google Inc. – Mountain View Corporate Headquarters” instead of “Google”) by including marketing taglines, store codes, special characters, hours or closed/open status, phone numbers, website URLs, service/product information, location/address or directions, or containment information (e.g. “Chase ATM in Duane Reade”) is not permitted. Do not use keywords next to your business name. Google will penalize you for it. You will not be included or will be removed from the 3-pack if you were already on it. TIP: Never try to fool Google, you can’t. (at least not for very long). Add new online business profiles on a regular basis. Sites such as Facebook, Yelp, Bing, SuperPages, DexKnows, Yahoo, YellowPages are good places to start. Make sure your NAP (name, address, phone number) is consistent across all platforms. It is very important to rank well with Google. When Google finds information on those sites that match your Google My Business and your website information, your placement in the local 3-pack will become more prominent. TIP: Make sure the information is updated as needed and accurate. Get reviews from your customers. Don’t be shy about asking them! Most of your satisfied clients will happily take a moment to write a review. Your reviews on Google My Business will increase your chances to show up in Google’s 3-Pack. Just remember to ask only a few customers at a time, since getting too many reviews at once can look spammy to search engines. 84% of consumers trust online reviews as much as personal recommendations (Source: BrightLocal). TIP: Get at least 5 reviews to get a listing with stars. 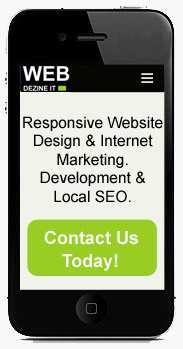 Make sure that your website is mobile-friendly (Google recommends a responsive website design). Google will not show a non mobile-friendly site in mobile search results. It also needs to be fast, user-friendly with unique informative content. This will help in keeping customers and potential clients engaged on your site, motivating them to contact you and/or buy your products and services. Be mobile-ready for “near me” mobile searches: It is especially crucial for brick-and-mortar businesses to be mobile-ready for those specific on-the-go searchers. 60% of all searches are now conducted on mobile devices. 82% of smartphone users say they consult their phone before shopping in a physical location. TIP: If your website is too slow, no one will wait for it to upload. This can be time consuming and challenging. Consult with us if you need help with Google My Business process as it can be a little tricky. We will set up an account for you and go through the verification process with Google, to make sure it’s valid. If your local competition is high, you will need a long-term SEO strategy. We love helping local businesses! Nothing is more rewarding to us than beat your competition. And we happen to be really good at it…[Read more about how our Search Engine Optimization can help your business]. 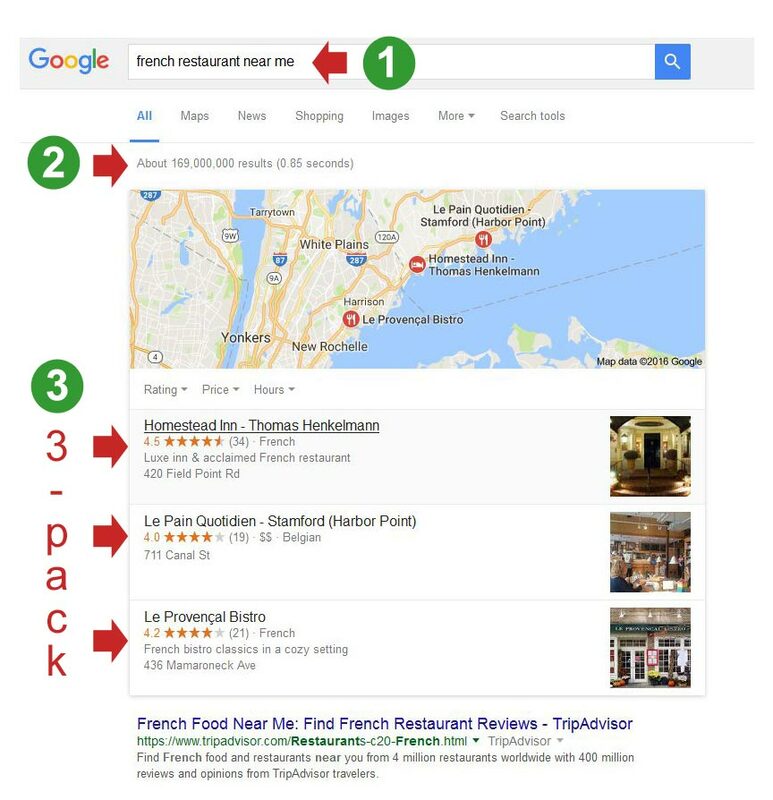 We will do our best to put your business in Google’s 3-Pack and keep it there!